Debt Free, Cashed Up and Laughing - The Cheapskates way to living the good life: Teach Yourself to Crochet Using You Tube! I do this too! and now Im learning to read knitting patterns. I feel very proud of myself when I make something that I learnt to make all by myself with the aid of you tube. Aren't we blessed to have YouTube and Google? Good on you Angela. So many skills are being lost, and it's happened mainly in the last 50 years or so, because everything is available ready made. You should be proud of yourself when you make something, you are keeping old skills alive. Jenny another great place for patterns is lionbrand.com.au. It's a fascinating website, loads of free patterns etc. Knitting Daily is a free daily email with, obviously, knitting tips, patterns, etc that is very interesting and useful too. You can subscribe to it at www.knittingdaily.com/ Download the free ebooks, there are some lovely patterns in them. 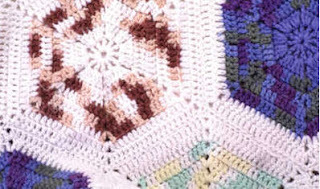 Several times I've thought I'd love to learn to crochet, if only to be able to make those beautiful GRANNY SQUARES. Well, I'm 72 now and I'm going to go and Google LEARN TO CROCHET and I'll be blowed if I don't finally learn how to do it......! My mother could crochet ANYTHING but for some reason she never got round to teaching ME...! So when I learn I'm going to teach my grandkids how to do it. It's never too late to learn. Crochet is really very easy, it's just the amazing patterns that make it look complicated. I love it because to me it is much faster than knitting, especially for babies and children. It's also very forgiving - I often just make up the pattern as I go, especially for borders on towels and face washers. Once you've learned to wield that hook a whole new world of handicrafts opens up to you. I too have rekindled my passion of sewing with YouTube. Have learnt so many different and new techniques.